Bask in the golden glow of this notable creation for a look of sumptuous allure. This ring is crafted in polished 14K yellow gold. It features one oval cut 18 x 14mm citrine stone in a prong setting at the center. It is surrounded by 108 full round cut diamonds in prong settings. They are at the shoulders and "fringed" extensions at the perimeter of the showy center stone. 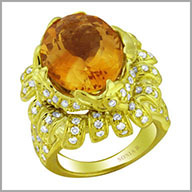 The total citrine weight is 10.50ct and the total diamond weight is 1.35ct (both approximate). The diamond color is G-H with a clarity of SI. 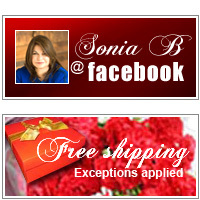 The setting size is 3/4" x 7/8" with a height of 7/16".